Collectively, they call themselves Seattle Urban Wineries, and they stretch from Green Lake to South 95th Street. TOM STANGELAND’S approach to winemaking is not the idealized vision of endless blue skies and sweeping vineyards. Fourth Avenue South is not your typical wine country. And the Duwamish Waterway’s only resemblance to the Columbia River is that they’re both wet. Stangeland, owner of Cloudlift Cellars, doesn’t care. He crafts his wines between a plumbing fixture supply store and a business that specializes in garden statues. He’s 10 minutes from his home on Capitol Hill, and he cannot imagine living or working anywhere else. O•S Winery 2012 red, Columbia Valley, $15: This Bordeaux-style blend is an opulent red with aromas and flavors of black cherry, boysenberry, cocoa and a hint of leather. Northwest Wine Academy 2012 Boushey sangiovese, Yakima Valley, $16: Crafted by the faculty and students at South Seattle College, this sangiovese offers aromas and flavors of cherry, red currant and milk chocolate. Cloudlift Cellars 2012 Ascent cabernet franc, Horse Heaven Hills, $27: Classic aromas of dried herbs and Rainier cherry lead to bright flavors of red currant and ripe plum. Pair with braised pork or smoked ham. Stangeland is part of a growing group of winemakers happily dodging raindrops and traffic to work in Seattle. Collectively, they call themselves Seattle Urban Wineries, and they stretch from Green Lake to South 95th Street. More than 20 wineries dot the city, and that number is growing steadily, including producers such as Eight Bells (Ravenna), O•S (Georgetown), Bartholomew (in the old Rainier Brewery) and Northwest Wine Academy (West Seattle). These wineries get their grapes from the arid Columbia Valley, but they don’t spend too many hours away from the grittiness of the city, where warehouses and storefronts are being converted into crush pads and fermentation rooms. Stangeland, a master woodworker and high-end furniture craftsman, built what he jokingly calls “the world’s smallest barrel room.” It looks as if it can hold four 55-gallon oak casks, but he manages to squeeze in a dozen. 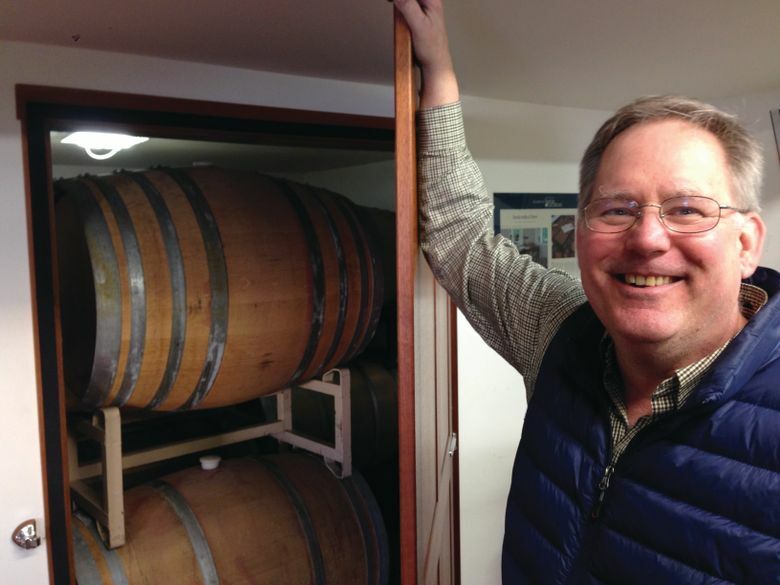 Thanks to the growing popularity of Cloudlift wines — Stangeland has more than tripled production since his inaugural 2009 vintage — he’s trying to figure out how to build a bigger space for his barrels. Nothing is particularly easy about urban winemaking. Getting the grapes here is arduous at best, and real-estate prices are rising, particularly in the gentrified Georgetown neighborhood. So trendy that Walla Walla juggernaut Charles Smith is locating to Georgetown. Stangeland and his fellow winemakers are counting on more enological entrepreneurs avoiding the growing competitiveness in Woodinville and instead becoming friendly neighborhood vintners with access to 3 million locals. They’re perfectly happy with gray skies, and they aren’t willing to give up the city they dearly love. Andy Perdue is a wine author, journalist and international judge. Learn more about wine at greatnorthwestwine.com.